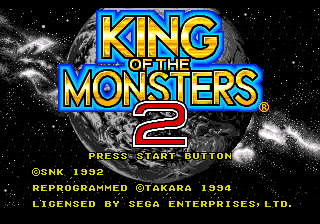 King of the Monsters 2 is the sequel to King of the Monsters. It was released for the Sega Mega Drive exclusively in North America in 1994. Like its prequel it was originally released for Neo Geo hardware, and was severely watered down in its conversion to the Mega Drive. The Sega version was also heavily modified in terms of gameplay, making it more of a 1 vs 1 fighting game. Main article: King of the Monsters 2/Magazine articles.